Click the photo to reveal the answers or read the discussion below. Three species of gulls can be identified with certainty in this photo. Most are about the same size and same shade of gray on the mantle. Furthermore, we can see that several have rather heavy yellowish bills, blackish primaries with small white apical spots, and thick white tertial crescents. These are adult Herring Gulls. A few birds are brownish or a mixture of brown and gray. These are first and second year Herring Gulls. 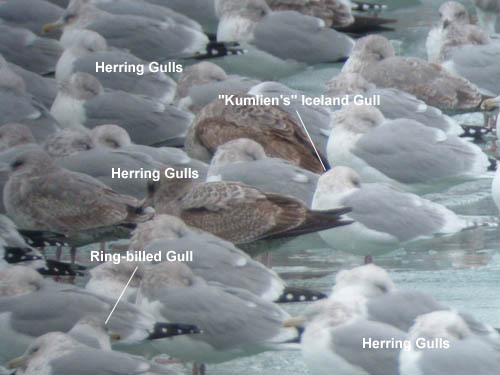 The bird in the lower right corner of the photo looks different, especially when compared to the nearby Herring Gulls. This bird is smaller and has a slightly paler gray mantle. Also, the primaries are dark gray rather than black. This is an adult "Kumlien's" Iceland Gull. 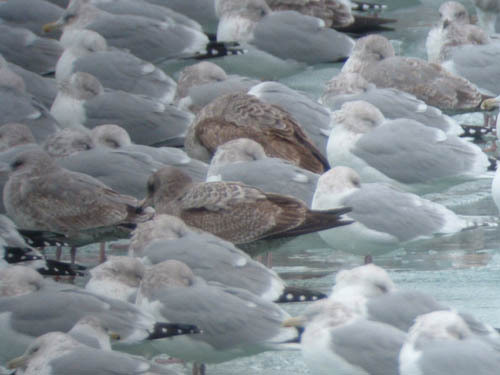 Finally, there's an adult Ring-billed Gull hiding in the lower left part of the photo. Taken at North Point Marina in Lake County, Illinois on January 1, 2005.